Self-Catering Holiday Accommodation at The Old Coach House, Cromer, Norfolk. 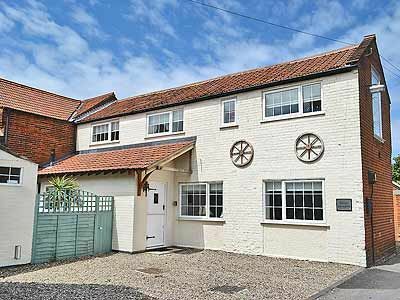 Our historic former coach house and stable was built circa 1875 and was once owned by a prominent Cromer family, the Cabells. It lies in a very peaceful location down a small lane yet it is just a four minute walk to the sandy beach with its famous pier and promenade, whilst the town centre with its wealth of shops, cafes and restaurants, and cinema are all equally as close. It has been refurbished & updated to provide wonderful self-catering holiday accommodation with modern living facilities. Cromer boasts carnival week (held during the third week of August), an RNLI lifeboat station and museum, an 18 hole cliff top golf course as well as promenade gardens and pier with theatre hosting concerts and featuring visiting performers. Shops and pub 200 yards. If you want to escape to the country or to the Norfolk Broads for a day, then Cromer is equally well positioned being less than 30 minutes from the Norfolk Broads. Due to its proximity to the coast the holiday cottage has been decorated throughout with a sophisticated nautical theme. Our self catering holiday accommodation comfortably sleeps 6 people and has private off street car parking for two cars. For guests who do not drive, our property is a 2 minute taxi ride from Cromer station, or a leisurely 10 minute walk. The holiday cottage is immaculate inside and out, with great attention paid to detail and cleanliness. If you are thinking of visiting us in this beautiful coastal corner of Norfolk for a family holiday, a romantic break, or an outdoors adventure, we are extremely keen to make sure you get the most out of your stay. Whatever questions you have whether they are about the house, the furniture, where to eat, what to see, places to visit, please get in touch with us through the Contact Form and we will be only too happy to help you with your arrangements. We know how important choosing the right property can be when booking a holiday, so no matter what your question, please ask, and we will do our very best to help! Ground Floor: Living/dining room. Kitchen. Bathroom with over-bath shower and toilet. First floor: Double bedroom with en-suite shower room with toilet. Two twin bedrooms including one with TV/DVD & Playstation 3. Electricity, full gas CH, bed linen and towels included. Free unlimited Wi-Fi and weekend telephone calls to UK landlines.